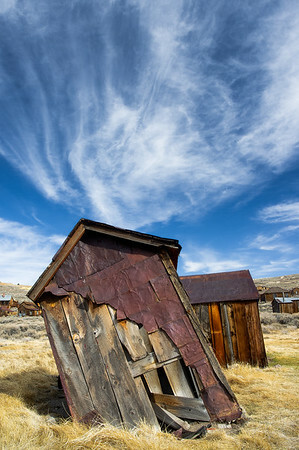 This is my favorite little outhouse at Bodie…to shoot, not to use! It's barely supported with a wood board on the opposite side and is leaning so far over I wonder how park service manages to keep it from falling down. The clouds on this early Spring day made it worth another shot as they appeared to rise from the decayed and crooked roof.